Easy=Safe is a new concept in transportation of wheelchair users, especially for private transport and small Taxis, where space is limited and traditional solutions represent a big compromise in terms of comfort and usability. In order to maximize safety we have developed a new System, which improves caregiver’s inclination to a correct use of all the safety devices. Thanks to its long time experience in vehicle conversion, and along with the unique features of the innovative Fiorella Lift, Focaccia Group can provide Easy=Safe solutions on a wide range of vehicles. The caregiver doesn’t need to get in and out the vehicle and the whole operation is effortless and risk-free. 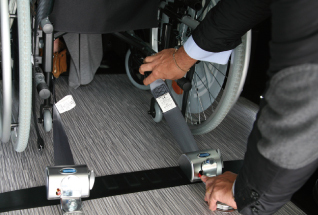 In order to maximise safety during the transport of people seated in wheelchairs, and thanks to its long time experience in vehicle conversions, Focaccia Group has developed a quick and easy-to-use system in order to improve caregiver’s inclination to a correct use of all the safety devices. The tie-down of the wheelchair and the securing of its occupant are operations that require several steps, thus becoming quite long. 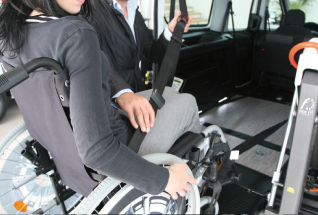 For both the wheelchair user and his/her caregiver, the procedure is not comfortable, especially when performed in compact vehicles with reduced dimensions, where space for manoeuvre is reduced. As a result, passengers might be somehow discouraged to properly use safety devices. The idea comes from observing the action performed by every non-disabled passenger getting into the vehicle and wearing his/her seatbelt: a fast and simple gesture. The aim is to make this operation, which was previously laborious, easier also for the person seated in a wheelchair who must be assisted in the tie-down operations. 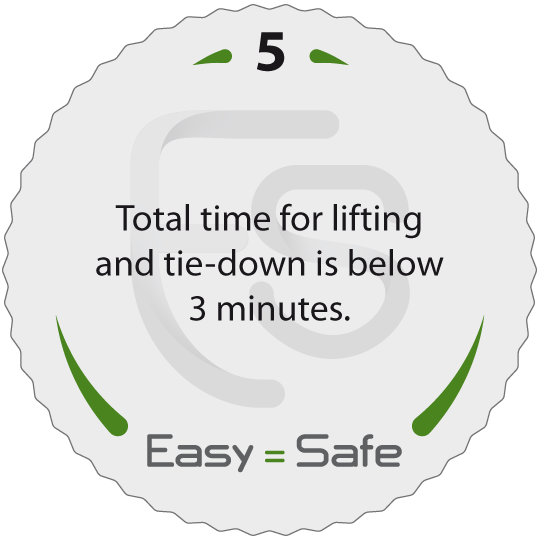 With the Easy=Safe concept instead, the complete procedure of wheelchair lifting and tie-down is made possible in a time interval of less than 3 minutes. Easy=Safe configures a set of efficient and fast operations in order to achieve full compliance with the existing legislation on disabled people transport, providing maximum comfort for the person with reduced mobility and his/her assistant. The caregiver doesn’t need to get in and get out the vehicle to tie down the wheelchair and allow its occupant to wear a seat belt. Front tie-down of the wheelchair is made before lifting it up, maximizing comfort for the caregiver and safety for the wheelchair user. Front tie-downs are electrical and thus, once activated, they prevent the wheelchair from moving back on the platform during lifting. The wheelchair passenger feels reassured and it is thus possible to proceed with the operations for the wearing of the seat belt. The 3-point seat belt can be worn standing outside the vehicle: safety has never been so easy! While the person seated in a wheelchair enters the vehicle, the seat belt will adapt naturally to his/her body, positioning itself correctly to ensure its proper fit and the maximum safety. 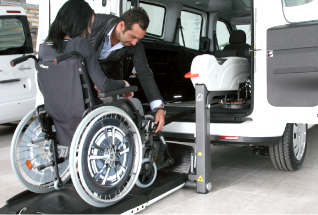 Thanks to the characteristics of the Fiorella Slim Fit lift, equipped with the innovative F-Twister swivel base, the wheelchair rear tie-down is performed outside the vehicle, with no effort for the caregiver and in few minutes. The person with reduced mobility experiences complete serenity during the transport phase and travels in full compliance with European Directive 2007/467/EC, guaranteed by the adoption of the 4-point wheelchair tie-down system and the wearing of the 3-point seat belt.